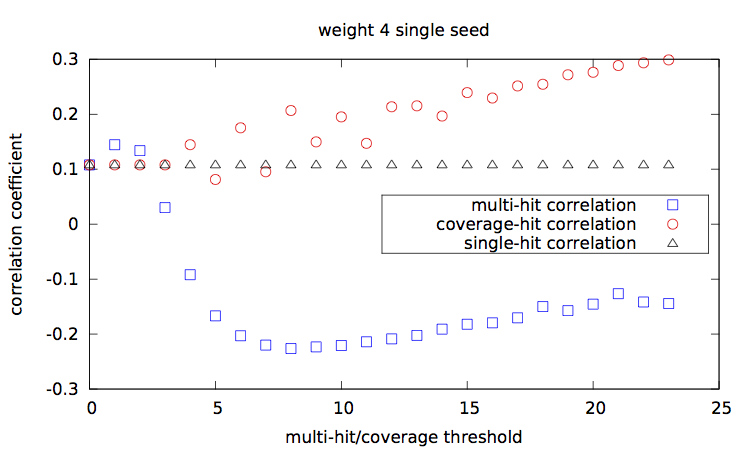 This page contains experimental datasets, results and associated scripts related to the paper A coverage criterion for spaced seeds and its applications to SVM string-kernels and k-mer distances. The content is divided into two parts that are related respectively to the sections 4.1. 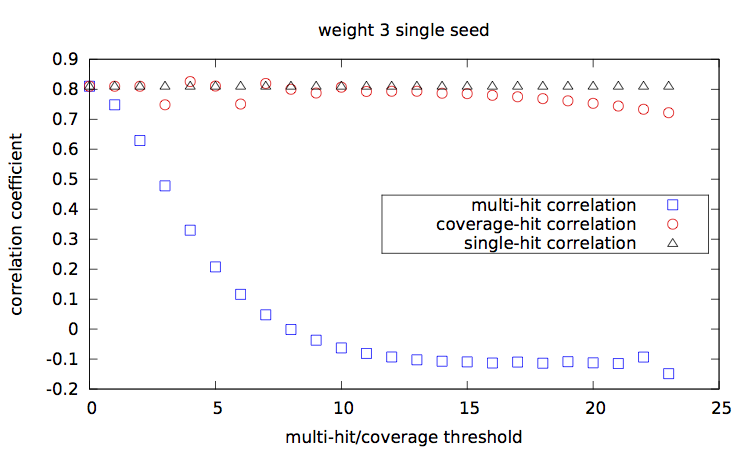 Coverage sensitivity and spaced seed string kernels and 4.2 Coverage sensitivity and alignment-free distance for sequence comparison of the paper. The Matlab (Octave compatible) code is available upon request to Donald E. K. Martin. The initial dataset used is a multi-fasta file composed of 383004 sequences belonging to 2208 families from RFAM v11.0 [ftp://ftp.ebi.ac.uk/pub/databases/Rfam/11.0/Rfam.fasta.gz]. This multi-fasta file is processed to generate a set of (name normalized) fasta files using a script [splitfasta.pl]. The "Rfam" directory containing the fasta files is then processed by a second script [main.pl]. the full set of features is randomly split into two train and test subsets, with help of a second ad-hoc tool split [dir]. it outputs the correlation values between zero one-error rates for the SVM, and each or the theoretical sensitivities (for all the seeds of a given family size and a given weight) with the help of a script [corr.pl], and plots them [main-w3-n1.gp|main-w3-n2.gp|main-w4-n1.gp|main-w4-n2.gp]. 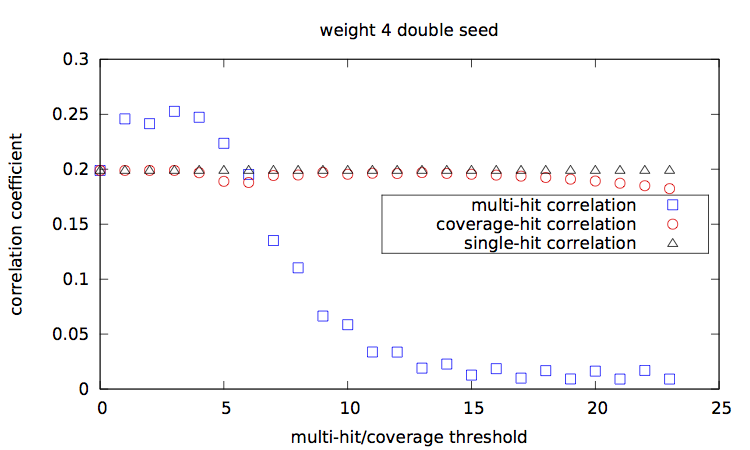 Given a set of seed(s), [seeds.txt], a main script [main.step.pl] computes, for each seed, for each alignment percentage of identity, and each of the 1000 trials, the Hamming distance, the estimated multi-hit and coverage values. 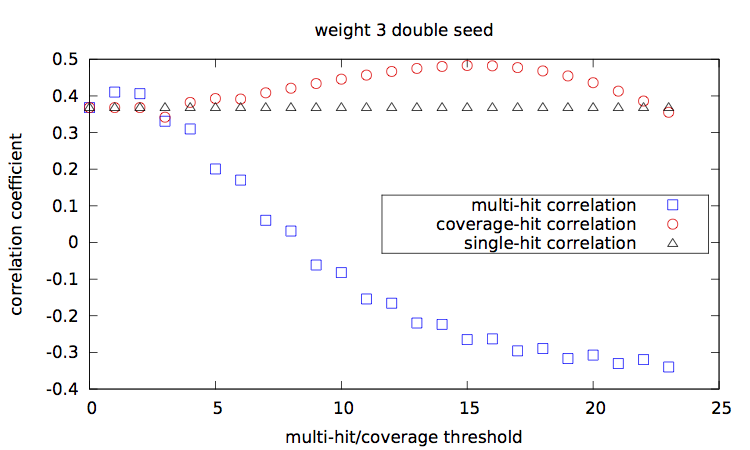 During computation, it updates two correlation values, between the Hamming distances and each of the multi-hit values and coverage values. 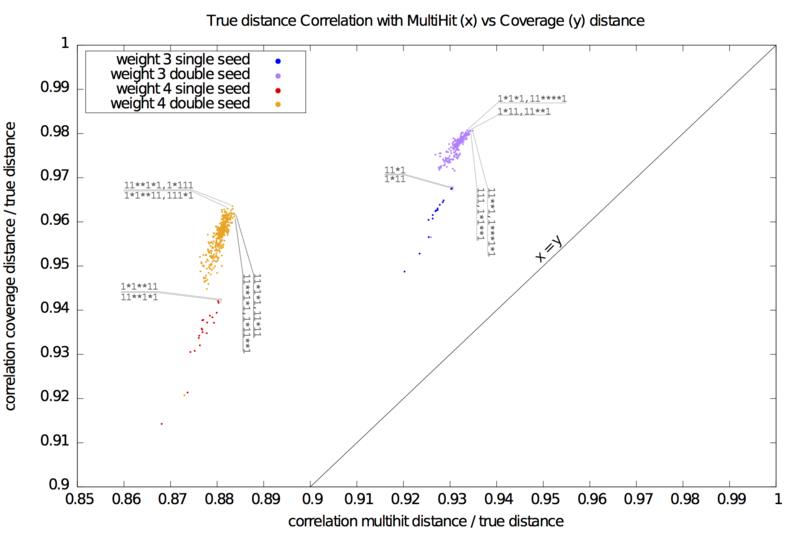 At the end, it outputs these two correlation values for each seed. Correlation values [results.w3-n1.dat|results.w3-n2.dat|results.w4-n1.dat|results.w4-n2.dat] are then plotted with a script [results.gp].